As predicted by Pieter VanderWerf about a year ago, code bodies in the United States are moving toward mandating green building standards in national building codes. A major step in that direction was announced last month when four major organizations announced they were launching the International Green Construction Code (IGCC), an adoptable and enforceable green building code. Refrigerating and Air Conditioning Engineers (ASHRAE), the U.S. Green Building Council (USGBC), and the Illuminating Engineering Society of North America (IES). For decades, ICC and ASHRAE have worked to develop codes and standards that become the industry standard in the design and construction of residential and commercial buildings in the U.S. and internationally. 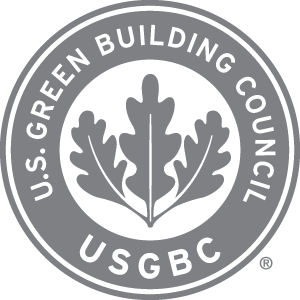 USGBC has been leading a nationwide green building movement centered on the LEED Green Building Rating System since LEED was launched in 2000. The convergence of these efforts in the IGCC is perhaps the most significant development in the green building movement in the past 10 years. State and city governments seeking to enact green building laws just got a hand from the Portland Cement Association. The PCA has developed a template to help administrators address high-performance and sustainable building practices. Called High Performance Building Requirements for Sustainability, it contains a sample ordinance written in mandatory language that can be amended to the International Building Code (IBC). The PCA is offering the paper as a free download. Insulated Concrete Forms again took the spotlight when Nudura-brand ICFs were featured in the February 14th episode of ABC’s Extreme Makeover: Home Edition. The two-hour special showed the construction of two separate projects near Washington D.C., and cast a brief spotlight on the advantages ICFs offer. The actual construction took place in August 2009. The first project was rebuilding the Tripp home. The family invites 40 children each week over to their crowded home for a hot meal and fun activities. Living in a home that is only 900 sq. ft. and literally rotting away made it unsafe. The couple pays for the youth program out of their own pocket, so repairs were beyond their budget. A similar program nearby, called The Fishing School, was also in dire need of repairs. That’s where Nudura, ICF installer Burch Builders Group, LLC, and concrete and ICF supplier Chaney Enterprises came in. They decided to tackle both projects simultaneously, completing them within a week. To keep the projects moving, a special accelerating admix was included in the concrete. “Time is even more critical for such a specialized mix and once the truck’s mixer drum starts running, the mix must be poured and finished rapidly,” said Mike Hockenberry, manager of technical services for Chaney Enterprises who, along with Damian Caprinola, a technical services technician, were on site to monitor all the mixer trucks and concrete pours. Both the Tripp home and The Fishing School featured many green construction elements, including solar panels and various innovations using concrete. Pervious concrete, used on the sidewalk of The Fishing School and as a patio for the Tripp home, allows rainwater to percolate through its small openings. Now that the makeover is complete, there is plenty of room for both programs to provide opportunities to even more students. Well-known retailer 7-Eleven, Inc. has built their first “green” convenience store, using ICFs for the exterior walls. Located in DeLand, Florida just north of Orlando, the store uses Greenblock’s high-performance insulated concrete forms to ensure energy-efficient exterior walls. The 3,000+ sq. ft. store is a new design and construction concept for 7-Eleven and will serve as a prototype facility to determine if other stores will be built to similar green standards. Look for more information about this project in a future issue of this magazine. A prototype green single-family home is the first LEED-certified home in Miami-Dade county. Built with Reward ICFs, it is intended to demonstrate how a single-family house can be built affordably using environmentally friendly materials, techniques and mechanical systems. Sponsored by Miami Green Building and Palmetto Homes, the home played host to a large group of interested guests last November. In addition to being environmentally friendly, the home is certified as a fortified house, which means the owner will save 50% on insurance. A fortified house, according to architect Steve Luria has impact-resistant windows, a hip-shaped roof, extra nailing on the roof and reinforced concrete walls created by ICF construction. Features that helped earn LEED certification for the home, in addition to the air-tight envelope of ICF construction, are: rainwater collection, high efficiency heating and cooling systems, a tankless water heater, additional ceiling and water pipe insulation and eco-friendly finishes. All appliances are Energy Star rated. “Most green items have an additional up front cost, but result in savings on energy bills in the long run. We compared those costs to the cost of traditional concrete block construction, which is popular in this area, and we found this house will cost about 8% more to construct,” Luria estimated. The estimated annual energy and water savings are approximately $2,000, according to the Florida Power and Light and the Florida Green Building Coalition. 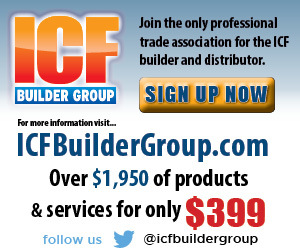 The ICF system is estimated to cost only $600 more than standard concrete block construction on the same sized house. “The additional cost of the ICF blocks, concrete and steel were largely offset by savings in labor, insulation, air conditioning and other material costs. 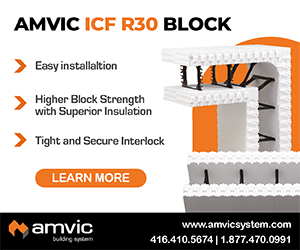 ICF construction requires fewer skilled laborers than concrete block construction and we did not need to attach furring strips to the ICFs. 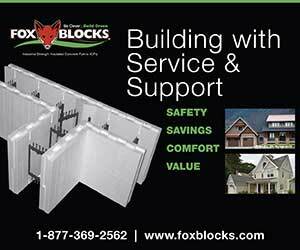 Reward ICFs have plastic ties embedded in the polystyrene which replace the need for additional furring strips required to anchor interior and exterior finishes.” Luria explained. Another cost saving is in the size of the heating and air conditioning unit. ICFs were featured on the nationally televised program Hometime, with host Dean Johnson. The Hometime Stone Cottage series on PBS started broadcasting weekly on February 27, 2010 and the in-depth ICF episode aired March 6th. Reward ICFs were used to construct the basement foundation of a cottage-style home on a wooded lot. With 13 episodes in the series, it starts by taking the viewers through the entire installation process, from the footings to stacking and pouring the ICF foundation, applying waterproofing, and constructing walls on top of the foundation. “Reward is excited to be part of a nationally syndicated show, educating home buyers and builders alike on the methods used in building a sustainable, energy efficient concrete home with insulating concrete forms,” says Ed Storm, president of Reward Walls. TF System, Inc., in conjunction with Intertek Testing Services, recently completed a full scale corner wall burn test to detail the impact of a fire on the vertical ICF system. This test was done to assure compliance with ASTM’s Standard E84 for surface burning characteristics of building materials. TF successfully passed the test and the company will continue its testing program to make further advancements in the residential, commercial, institutional and governmental markets. The Massachusetts Institute of Technology (MIT) is creating a research center intended to speed up the transfer of information between laboratory science and actual practice in the field. Named the Concrete Sustainability Hub, it is funded by the Portland Cement Association, and the Ready Mixed Concrete (RMC) Research & Education Foundation. Researchers from MIT’s School of Engineering, School of Architecture and Planning and Sloan School of Management are expected to participate in the CSH’s research activities. The new research hub has already acquired $10 million of sponsored research funding to be used over the next five years. A new study by Booz Allen Hamilton and the U.S. Green Building Council (USGBC) indicates green building will continue to boom for the foreseeable future. For instance, it reports that despite the economic downturn, green building will support 7.9 million U.S. jobs and pump $554 billion into the American economy over the next four years (2009-2013). In the previous five-year period (2004-2008), green building supported about 2 million jobs. The study also determined that green construction spending currently supports more than 2 million American jobs and generates more than $100 billion annually. The study was announced at the USGBC’s annual Greenbuild International Conference & Expo. A new blog relevant to the ICF industry is now online. Written by Vera Novak, formerly technical director at the Insulating Concrete Forms Association (ICFA), it covers all aspects of the green building movement. In the first post, she explains the blog’s goal, “In future posts, we hope to explore how construction process innovations can be implemented on any level of project,” she writes. “What would need to change for all housing to provide comfort and security for over 100 years? How can the building sector accept responsibility for the almost 50% share of total energy consumption and take steps to improve minimum energy performance benchmarks? Where are the real obstacles; how do we get past them?